1890’s: Official start of high school hockey play across Minnesota. 1900: First state mythical State Championship tournament is held. 1922: St. Paul Central defeated Duluth Central (5-3) in Duluth for states first official “North vs. South” game. 1923: Eveleth beat St. Paul Mechanic Arts (9-2) for the second state mythical State Championship. 1928: High school hockey played at approximately 25 schools in Minnesota. 1945: The first annual Minnesota State High School Hockey Tournament is played at the St. Paul Auditorium. 1947: The tournament is on radio for the first time, as Roseau’s games are broadcast back to northwestern Minnesota. 1947: St. Paul Johnson becomes the first school from the southern part of Minnesota to win the tournament, defeating Roseau 2-1 for the title. 1949: Minnesota private school - Independent League Prep School Championship took place with Cretin capturing the first title. League existed from 1949-1974. 1951: Eveleth wins a record setting fourth straight championship with a 4-1 win over St. Paul Johnson in the deciding game. 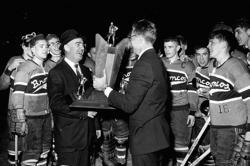 1955: In the longest tournament game ever played Minneapolis South defeats Thief River Falls 3-2 in 11 overtimes. 1955: St. Paul Johnson defeats Minneapolis Southwest 3-1 in the first all-southern championship game in tournament history. 1956: The first televised games of the tournament began. A Twin Cities television channel (KEYD, Channel 9) broadcast the two evening games on Thursday. They also did the Saturday championship game. The process of televising games was discontinued until 1961 when the championship and third place games were broadcast by Channel 11 (WTCN) from the Twin Cities. 1959: Tournament founder; Gene Aldrich, passes away on February 26, 1959. 1969: The tournament is moved from the St. Paul Auditorium and is played for the first time at the Metropolitan Sports Center in Bloomington, MN. 1970: As a result of expansion of the regular season for many teams, the time of the tournament is moved from February to March. 1971: The length of time for a period went from 12 minutes to 15 minutes. 1975: Private schools are allowed into Minnesota State High School League play for the first time, and into the tournament. Prior to that, they played in the State Catholic Tournament (1949-1969) and the State Independent Tournament (1970-1974). 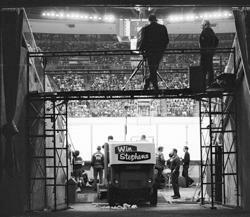 1976: The tournament is moved back to St. Paul, this time to the St. Paul Civic Center. 1991: State Tournament All-Tournament teams re-introduced after being discontinued following the 1972 Tournament. The MSHSL new premiere corporate partner at the time, First Bank (later U.S. Bank) sponsored the awards. 1992: Tier I and Tier II structure adopted. 1993: 146 teams participated in high school hockey. 1994: Class AA and A structure adopted. 1999: Tournament moved to Target Center in Minneapolis, MN. 2001: Tournament moved to the Xcel Energy Center in St. Paul, home of the NHL’s Minnesota Wild. 2004: The length of time for a period went from 15 minutes to 17 minutes. 2007: Coaches seed top four teams in each class. 2013: Coaches seed the top five teams (rather than four). 2019: The MSHSL celebrated the 25th Anniversary of Girls', and 75th Anniversary of Boys' State High School Hockey Tournaments.